Scientists from the Lomonosov Moscow State University, together with their Russian and foreign colleagues, have achieved the first direct measurements of giant electromagnetic fields emerging in dielectric particles with high refractive index at the scattering of electromagnetic waves. The researchers have presented their project results in Scientific Reports. Miniaturization of basic elements in electronics requires new approaches. It has thus become very important to create intensive electromagnetic fields concentrated in the smallest possible volume. Scientists from the Lomonosov Moscow State University in collaboration with an international team conducted the first direct measurements of a giant resonant field excited inside a subwavelength dielectric particle at the scattering of a plane electromagnetic wave and provided the complete quantitatively theoretical explanation of the observed effect. Physicist Michael Tribelsky, the leading author, says, "In theory, this effect has been known. In this case, the scattering particle acts as a funnel, gathering incident radiation from a large area and concentrating it in a small volume within the particle. However, there are many difficulties on the way to practical realization. Metallic nanoparticles were the first candidates for such 'field concentrators.' Unfortunately, they have deceived the expectations. The point is that metals have high dissipative losses in the most interesting applications area of visible light frequencies of the incident waves. The dissipation leads to significant energy losses, wasted for fruitless (and often harmful) heating of the nanoparticle, and diminishes the resonant enhancement of the electromagnetic field. In such a case, it would be natural to turn to dielectric particles. Unfortunately, it is not so simple to deal with them." If a particle does not have a high refractive index, the resonant effects are weak. Regarding the high-index particles, whose size is smaller than the wavelength of the incident radiation, the common belief was that the electromagnetic field hardly penetrated in such a particle. However, it turns out that at some frequencies of the incident radiation, the case is just the opposite. Namely, the field not only penetrates into the particle, but its high concentration may be observed. In a sense, the effect is analogous to the arc of a swing due to weak but well-timed pushes. "Our main result is that, to the best of our knowledge, we are the first to achieve the direct experimental evidence of the effect and measure the profiles of the excited fields," Michael Tribelsky says. The difficulties of the corresponding measurements at optical frequencies are related to the necessity of measuring fields within a nanoparticle, and the spatial resolution of the measurements must be on the order of nanometers. 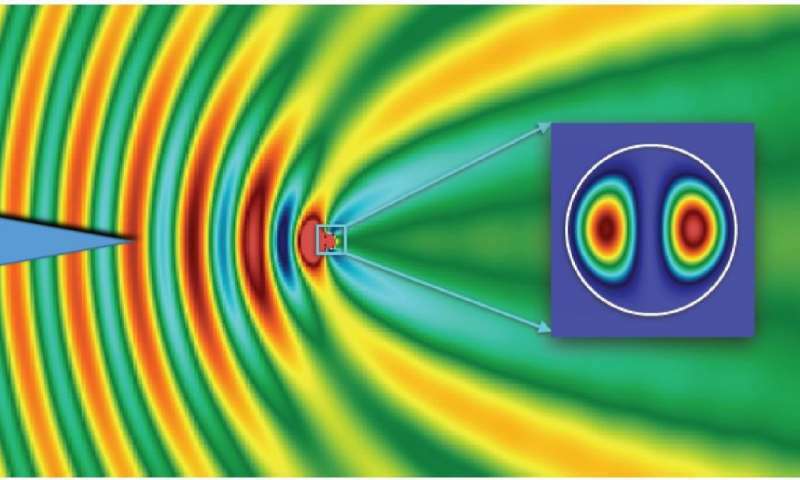 The researchers modeled the scattering of light by a nanoparticle by means of the identical scattering of radio waves by a centimeter-size particle. To be able to move a probe inside the particle, liquid dielectric (usual distilled water held at a certain fixed temperature) poured into a transparent for the incident radio wave container has been employed. The achievement lies on the very frontier of modern studies on subwavelength optics (namely optics dealing with objects whose scales are smaller than the wavelength of the incident radiation). These phenomena have applications including medicine (diagnosis and treatment of diseases, including cancer; targeted drug delivery and others), biology (various sensors and markers), telecommunications (nanoantennas) and systems for information recording and storage and other spheres. It could also be used for the creation of revolutionary new optical computers in which information is transferred not by electric pulses but by light packages. The scientist says, "In a broad perspective, our project may initiate the creation of a new landscape for design and fabrication of super-miniature nanodevices and metamaterials—namely materials that are artificially formed and structured in a special way to possess unusual electromagnetic properties."